This Bandido review was made after playing the game eight times as a co-op and about 30 times as a solo game. We were provided a copy of this game by the publisher in exchange for an honest review. 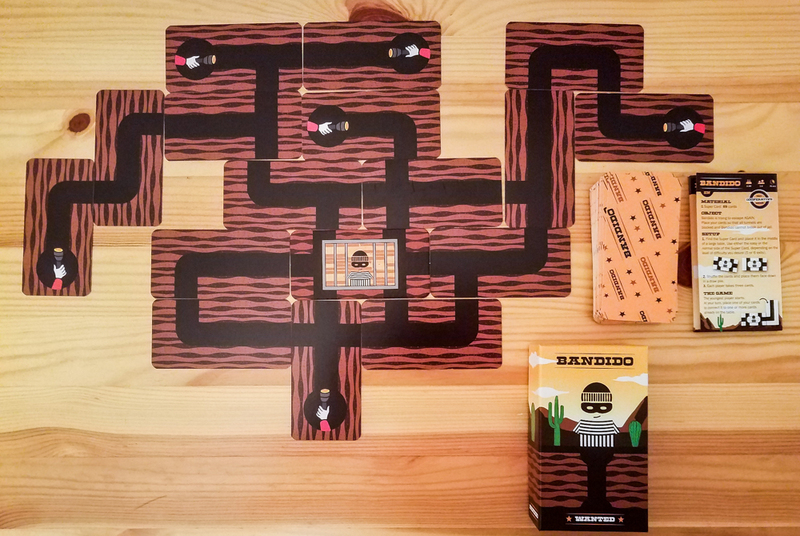 Bandido is a solo or cooperative card game in which you’re attempting to keep a prisoner from escaping by blocking all of the tunnels inside of the prison. The game was designed by Martin Nedergaard Andersen and is published by Helvetiq. 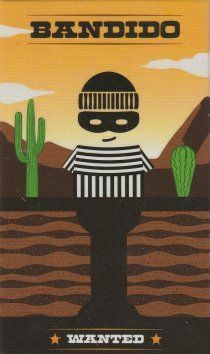 To begin a game of Bandido, you place the Super Card (the one showing Bandido in jail) in the middle of the table, shuffle up the cards, and deal three cards to each player. That’s it! That’s the setup. On a turn, you’ll place one card so at least one tunnel is connected to an existing tunnel and then you’ll draw back up to three cards. The one main rule is that you can’t block off any of the tunnels with walls when you’re placing a card. What you’re trying to do is close off every tunnel to keep Bandido from escaping. The cards with the flashlights are the ones that close off most of the tunnels, but there are other cards you can use to basically form a loop that connects multiple tunnels together. Everyone wins if you’re able to block all of the tunnels. You’ll lose if there are any open tunnels by the time you’ve gone through the deck. Probably what I like most about Bandido is that it’s a very simple to understand yet it’s also different than anything else I’ve played. That’s always a good combo. The puzzle can be pretty challenging. You might have six or seven open tunnels and you need to figure out which of your three cards to use to give you the best chance of closing some of them down. Bandido works equally well with kids and adults. You can play three or four games as a family (even with kids as young as 4 or 5) or you can use it as a filler with your adult gaming group. Unlike most other cooperative kids games, kids can actually play Bandido by themselves. Teach it to them once and they shouldn’t have any problems playing future games by themselves. You can set up a game of Bandido in about 10 seconds. And it takes about the same amount of time to put it away. This is about as portable as games get. You can carry this one around with you in your pocket. Some games are too easy. I’d say one out of every five or six games you’ll get great draws that make it extremely simple to close off all of the tunnels. This game can take up a surprising amount of table space. That’s the only thing keeping Bandido from being a great game to play on a train or plane. A minor issue that I have with the small rulebook is that it doesn’t tell you what you can and can’t say to your teammates. Bandido was designed to be a simple and relaxing solo or co-op game that anyone can play, and it definitely is just that. It’s not the type of game that’s going to blow your mind, but it’s a good one to break out when you’re on vacation, at the pub, or when you just want a quick game to play. I like Bandido as a co-op game, but I really think of it as a solo game that can be played cooperatively. This is actually my go-to quick solo game right now. It really does remind of Klondike solitaire, but it has a fun theme and I find the tunnel building a bit more satisfying than the basic tableau building in Klondike. So, should you get it? I’d say it’s worth taking a chance on if you’re looking to add a quick solo/co-op game to your collection or if you want a small card game that you can play with your kids. I think most people would be happy to have Bandido on their shelves. Thanks for taking the time to read our Bandido review! To stay updated on all things cooperative board games, follow us on Twitter, Facebook, or via RSS.